If you're a Microsoft Outlook user suffering from serious e-mail overload, consider Xobni Plus ($30, 14-day free trial), a pumped-up and for-pay version of the free Xobni Outlook add-in. It offers powerful searching and other features beyond what Xobni offers. With Xobni Plus, you can search for e-mail in just about any way you can imagine--not just by sender, recipient, date text in the body or subject line, but far more. You'll be able to also search by message size, the flag status of messages, and even text found in attachments. And there are more search criteria even beyond that. It also include Boolean searching, which lets you combine search terms, and perform very sophisticated searches. 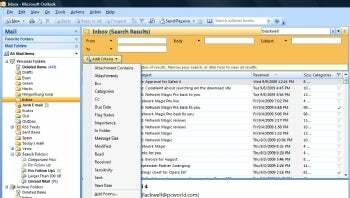 Xobni Plus helps Outlook users cut through e-mail clutter with powerful searching features, shown here. There are more features as well, including the very nice AutoSuggest, which suggests recipients of e-mail messages as you type in the address. Xobni Plus also offers better tools than the free version for searching through threaded e-mail conversations. It also shows, at a glance, every appointment you have with any particular contact, and lets you search through tasks and appointments. It also lets you search through multiple Outlook .pst files. All this is added to the power of the free version of Xobni, which may be the best addition to Outlook you can get anywhere, helping you cut through e-mail clutter with superior searching, extra details about your contacts, integration with social networking sites such as Facebook, threaded message reading, and more. Given all that, is it worth paying $30 to upgrade from the free version? For most people, the answer is most likely no; the extra features in the Plus version probably aren't worth it to most people. But if you suffer from serious e-mail overload, and need better searching that Outlook or the free version of Xobni offers, it may well be worth the price. Note: The downloadable file for Xobni and Xobni Plus are identical. In order to enable the 14-day trial period of Xobni Plus, click anywhere in the free version you see the word "Plus," and you'll be able to activate a 14-day trial period from the screen that appears. If you don't pay for it after 14 days, it reverts to the free version.